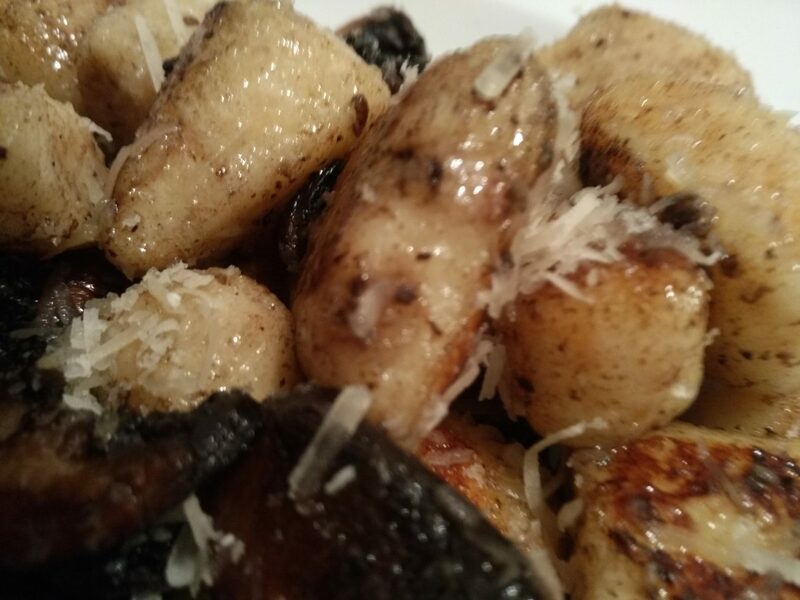 Golden crispy pan fried potato Gnocchi! 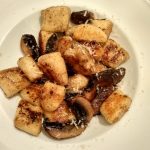 I just love Pan-Fried Potato Gnocchi, they have a crispy shell and tender on the inside. 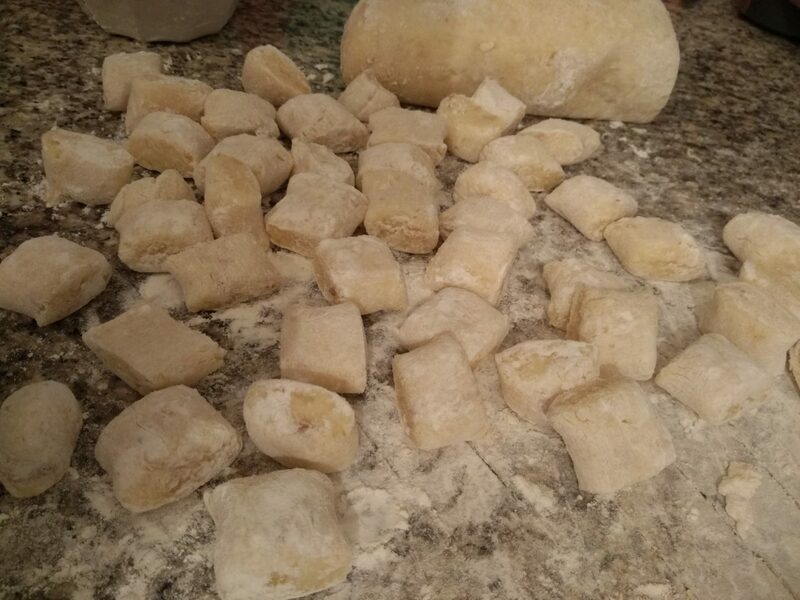 I guess almost everyone had the downfall in making potato Gnocchi just to find out they are dense and heavy. 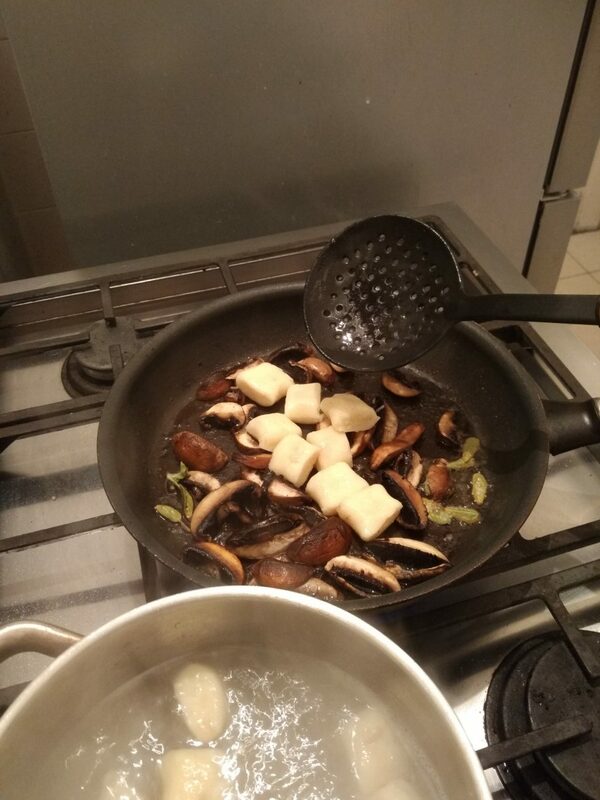 indeed, these small dumplings can be very tricky and require some experience to get it in the right consistency. 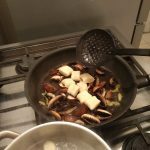 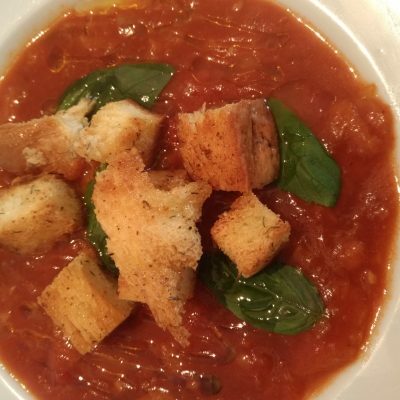 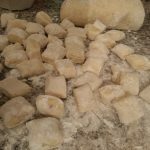 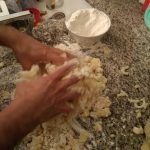 I have gone over all the stages in making the perfect Gnocchi in one of my earlier articles, follow the general guidelines and you’ll be fine, after all, accurate amounts are not possible to give from the inconsistency of the ingredients. 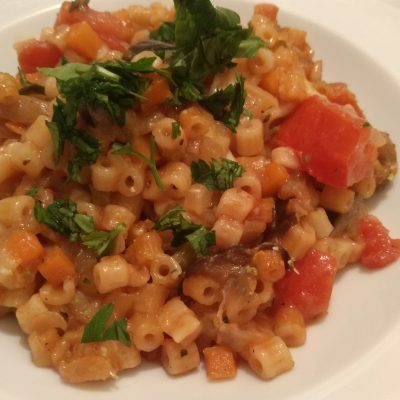 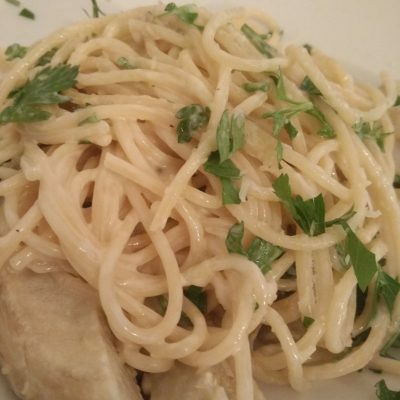 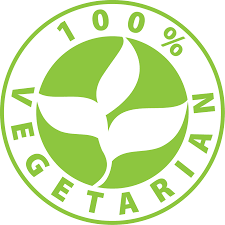 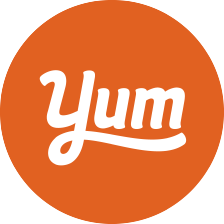 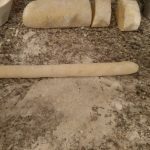 every potato has its own starch level, eggs are different in weight, flour differences and even climate can affect the outcome of the potato Gnocchi dough. 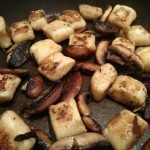 This take some time to get it right but once you nail it, there is nothing more rewarding than a fluffy light tender pan-Fried Potato Gnocchi that melts into your mouth. 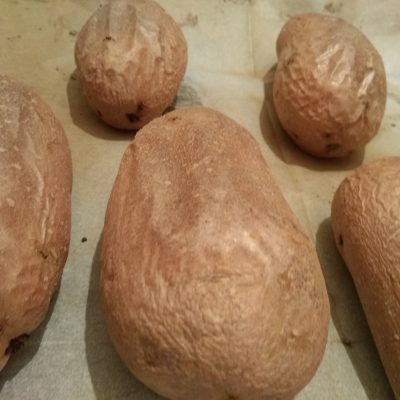 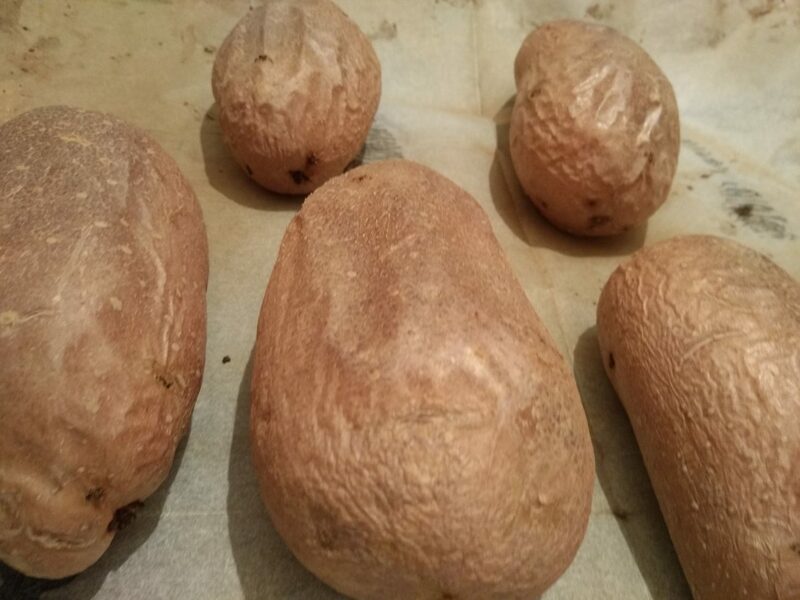 bake the potatoes with the skin at least an hour until they lose some of their water. 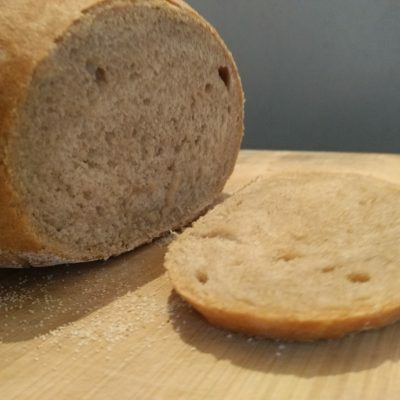 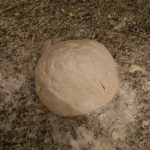 use common sense, when you think the dough is ready, don’t add more flour even if the recipe say otherwise. 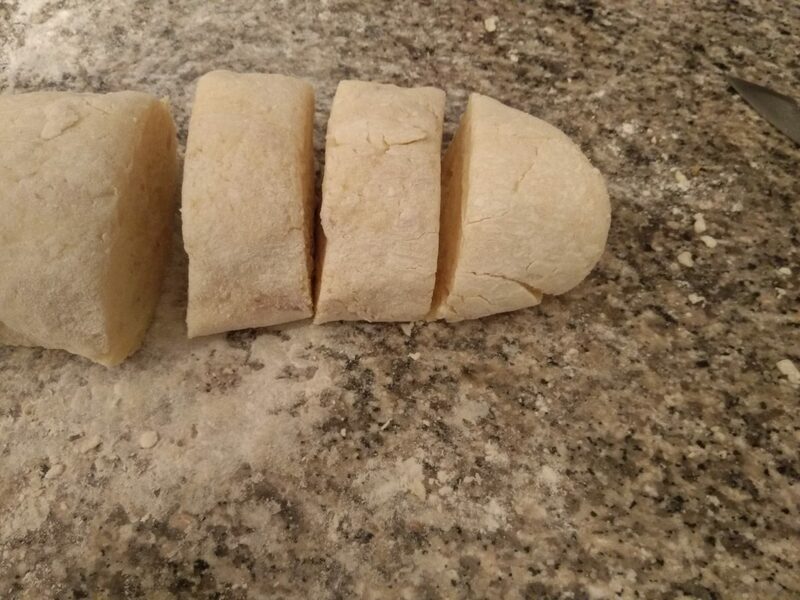 don’t over work the Gnocchi dough, we are just combining all the ingredients until they stick together as a dough, we are not kneading it like bread. 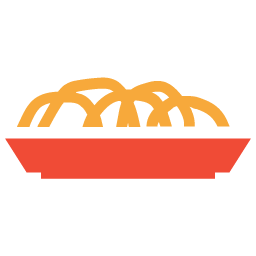 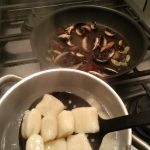 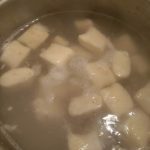 In this recipe I will sear the pan-Fried Potato Gnocchi in order to get them a bit more crisp and to cover them in the butter sage sauce while they are cooked on the pan. 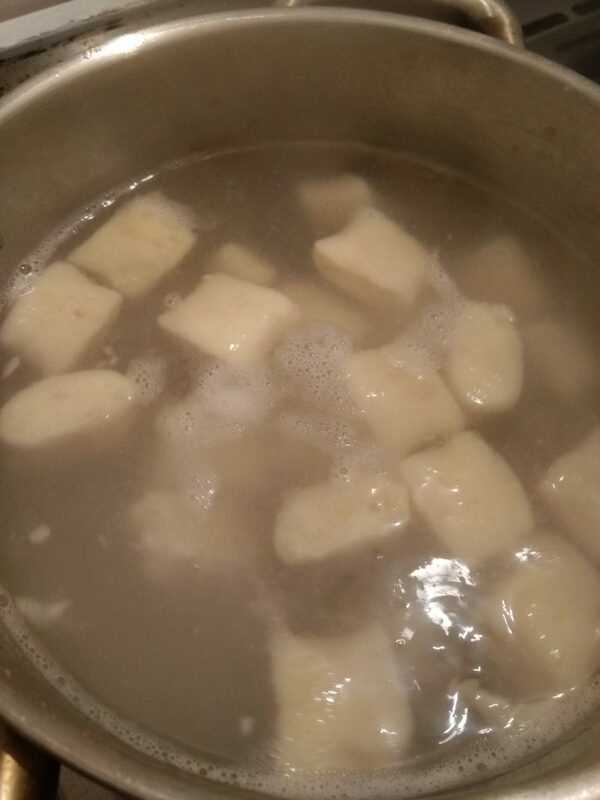 This will require you to coordinate the time the Gnocchi are coming out of the hot water into the hot pan, so be sure to set the time correctly, only after the water are boiling, throw the Gnocchi in and start the sauce. 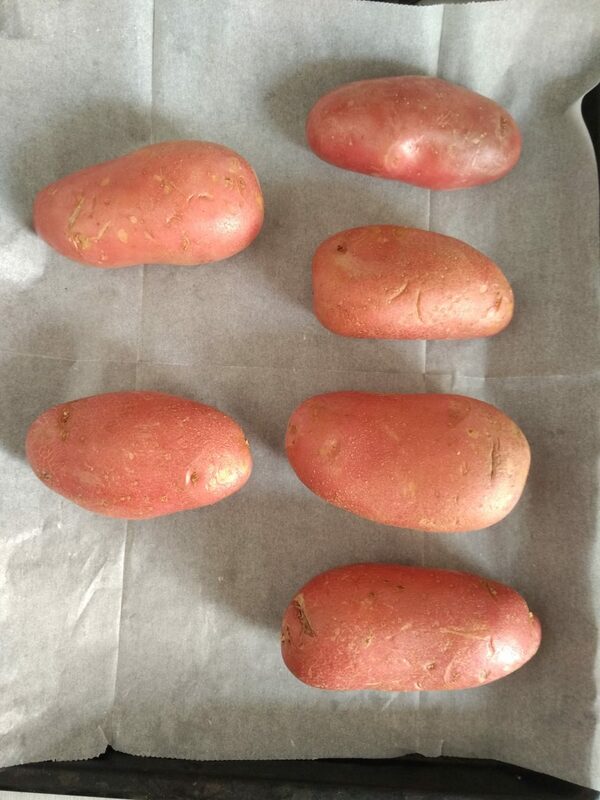 Place the potatoes full, skin on in a baking pan and bake for 1 hour and 20 minutes until brown on the outside (not burnt) and soft on the inside. 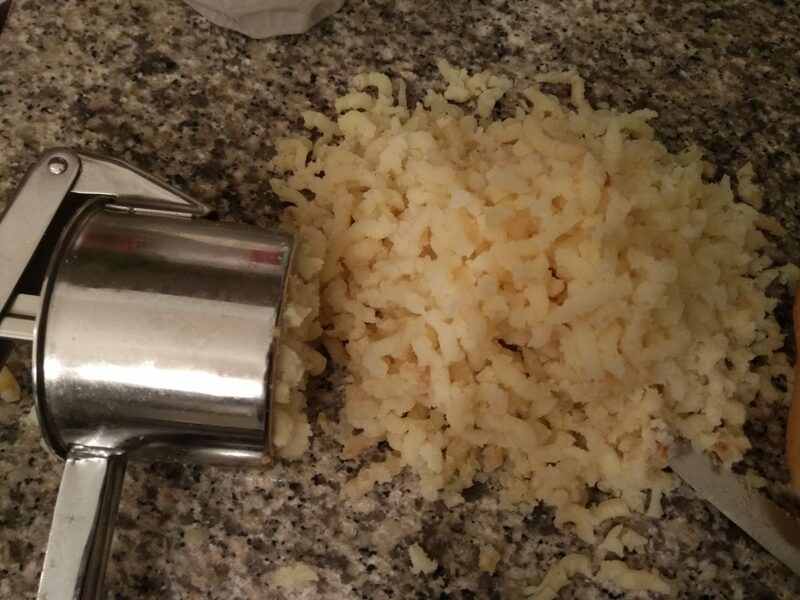 Skin the potatoes and place them in the potato masher and mash to a fine potato batter. 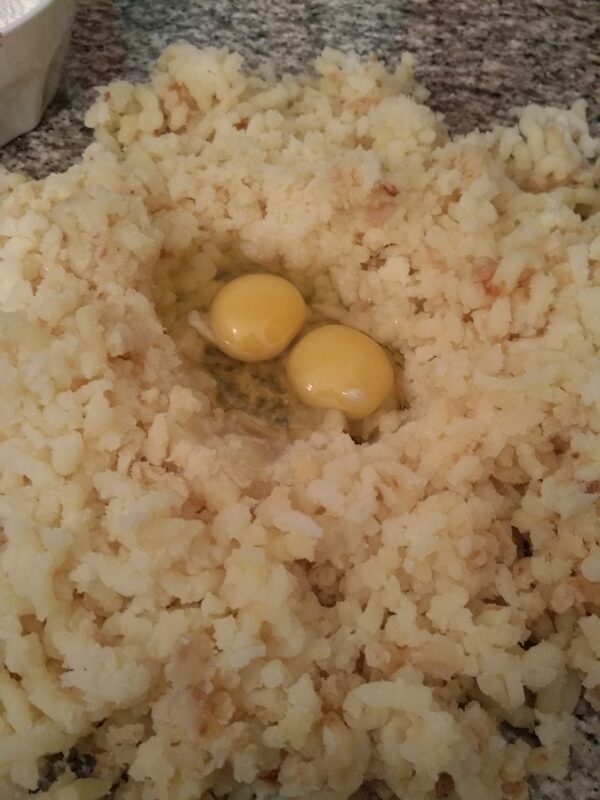 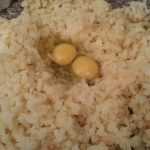 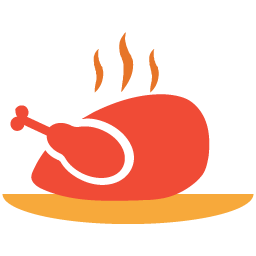 Make a small well from the mashed potatoes add the eggs and salt, throw in a bit of the flour and combine with your hands. 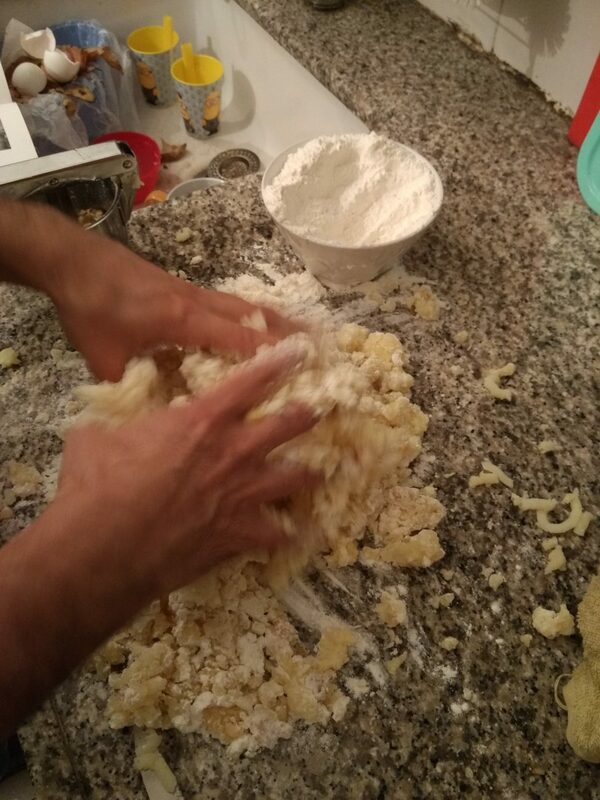 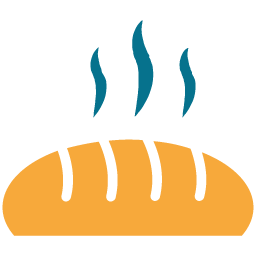 add some more flour and continue combining the batter until it's smooth, don't over knead the dough. 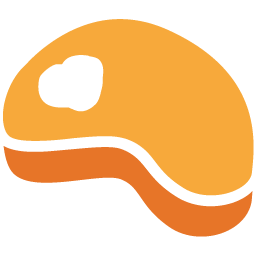 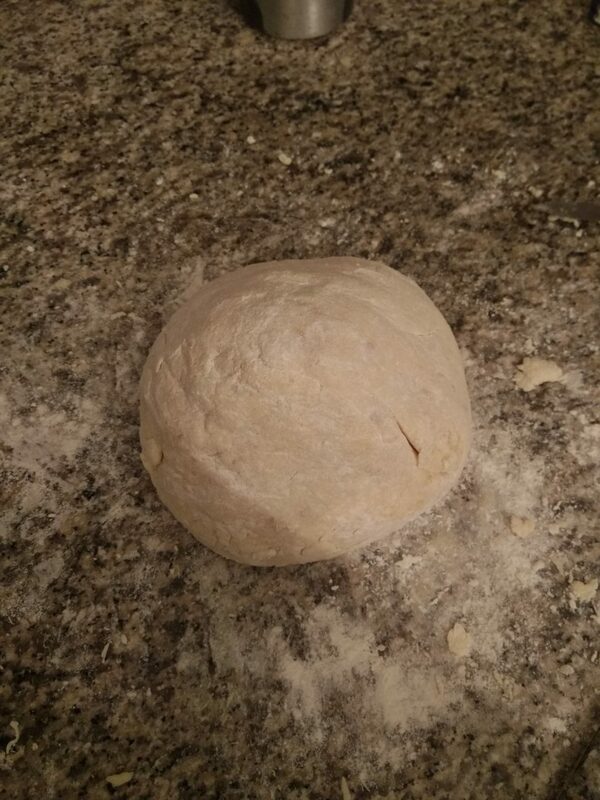 Form a ball shape of the dough. 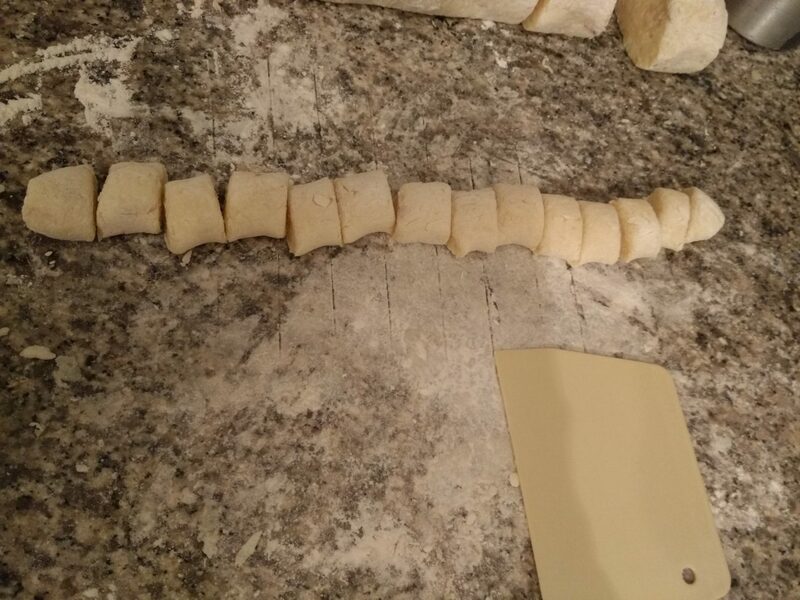 Roll the Gnocchi ball gently into an elliptic shape. 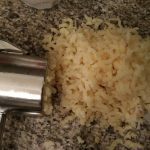 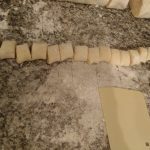 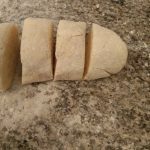 Cut it into a few pieces and roll each piece into a long narrow cylinder, cut into gnocchi shape with a knife or dough scraper and flour a bit so it won't stick. 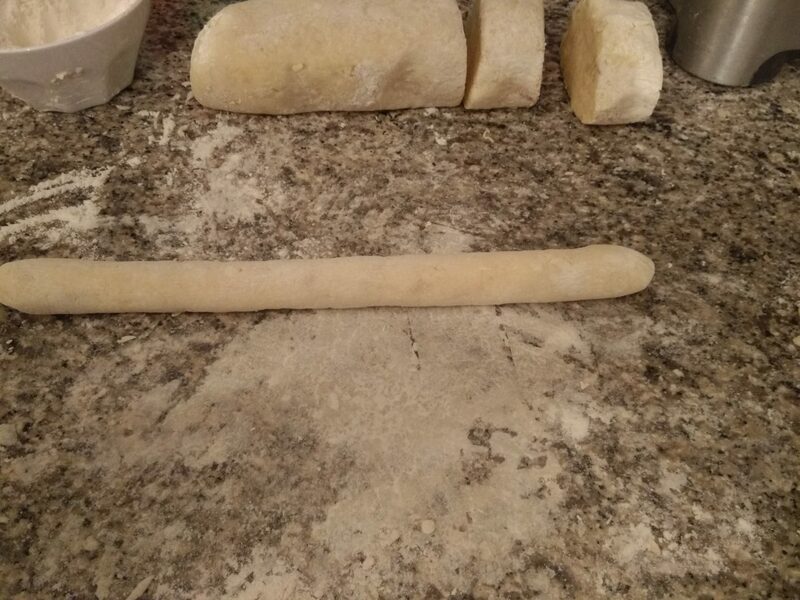 Prepare the rest of the dough like this. 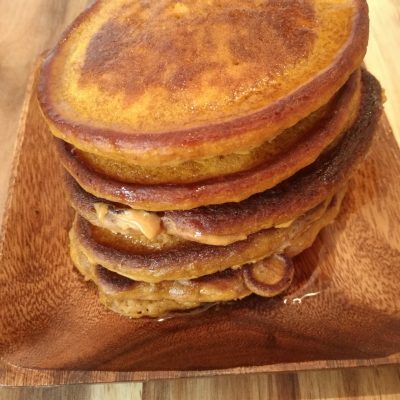 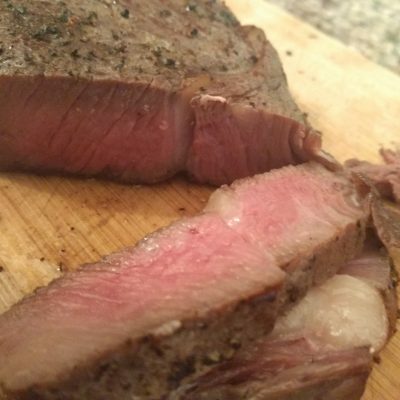 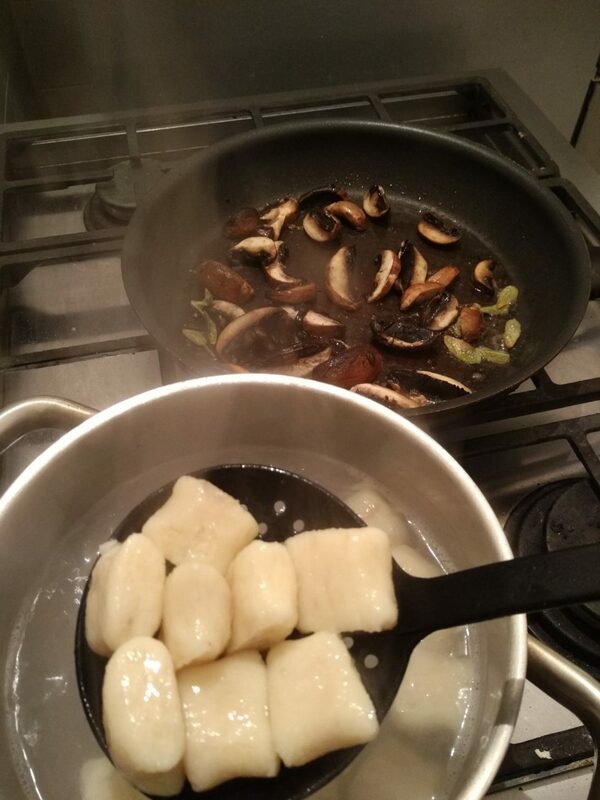 Meanwhile set an Iron skillet over high heat for 2-3 minutes, add butter, sage and mushrooms and cook for 2-3 minutes until mushrooms are golden. 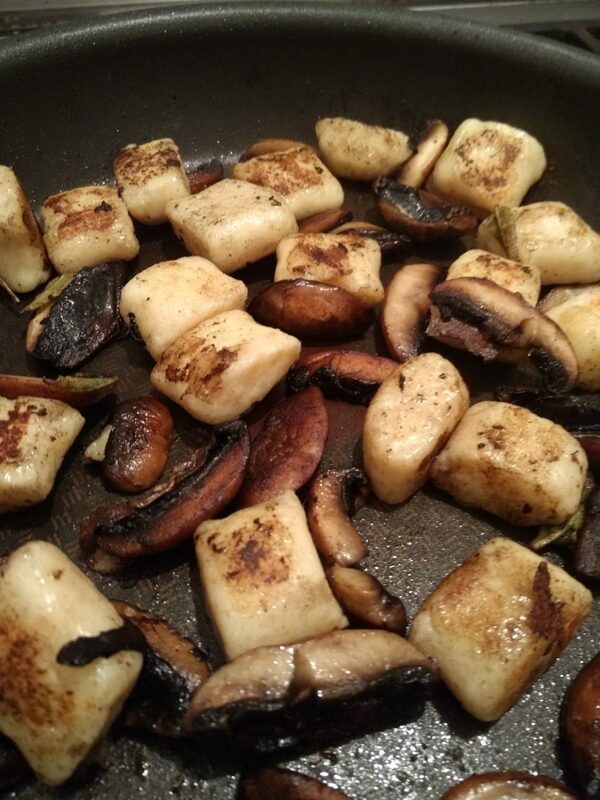 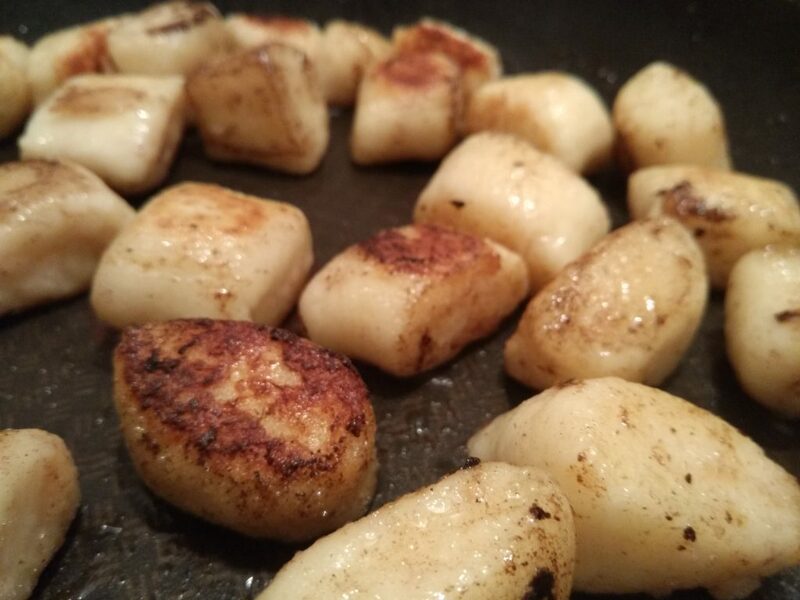 As soon as the Gnocchi float add them to the Skillet and sear for another 2-3 minutes until golden and crisp. 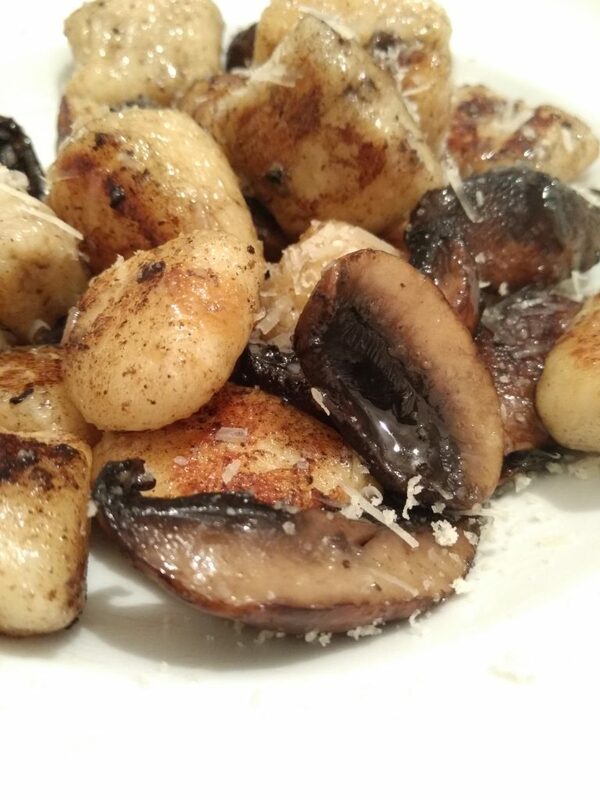 Remove from heat, put the gnocchi in a mixing bowl, add the truffle sauce, olive oil and salt. 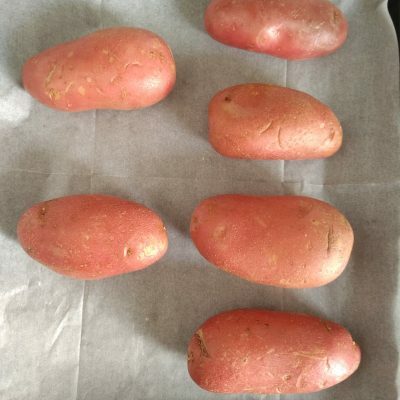 Mix with your hand and place on a serving plate. 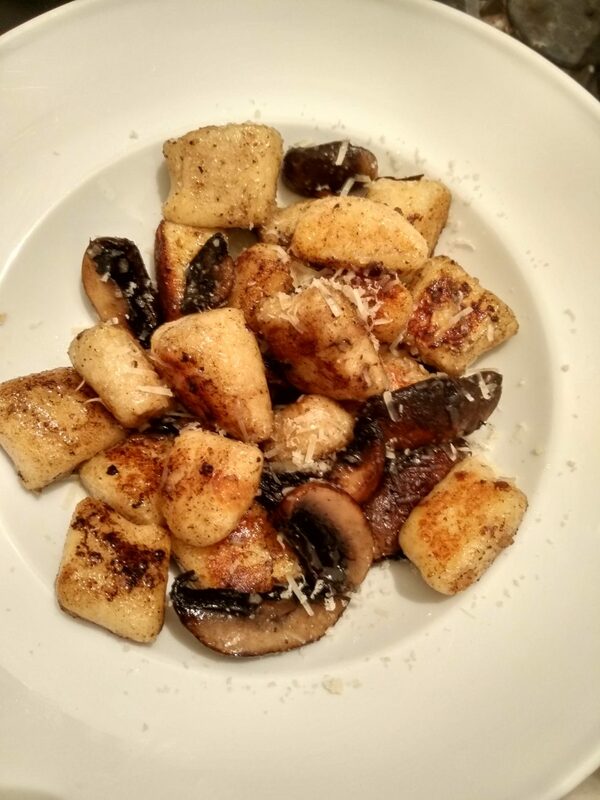 Sprinkle with some more olive oil and grate the parmesan before serving.